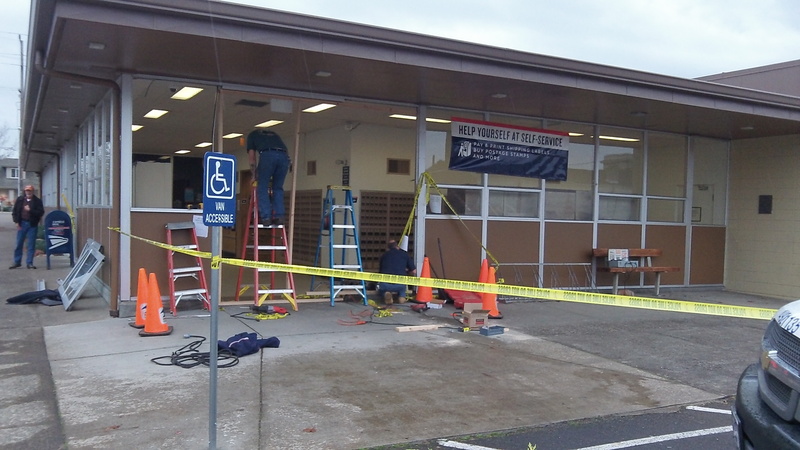 Repairs under way at the Albany Post Office Thursday afternoon. The Albany Post Office is supposed to reopen today (Nov. 15) after Thursday’s accidental drive-in. That’s according to the workers who labored late Thursday to rebuild the entry doors of the post office lobby at Second Avenue and Washington Street. Nobody else was there to ask. But why? During the lunch hour Thursday, a driver (a 64-year-old woman) accidentally hit the gas and drove into the lobby where the self-service kiosk and the post office boxes are. Luckily, no one was hurt. What was odd, though, was that the entire post office remained off limits to the public for the rest of the afternoon. Once the wreckage was cleared away, it was hard for outsiders to see any reason why people could not have gone in and out of the Second Avenue door and had access to their boxes. As it was, people were coming by all afternoon, only to be turned away by police tape and improvised signs saying the office was temporarily closed. “Guess I can’t get my mail today,” one man muttered on the sidewalk before he got back in his SUV and drove off. But why couldn’t he?